Smoked Turkey, Pepper Jack Cheese, and Basil Panini is a crispy panini stuffed with flavor. Inspired by Oprah’s Love Sandwich. Have you heard of the 5-second rule about dropping food on the floor? I made it up. I didn’t realize it at the time, but think I did. As a teenage girl, I spent many summer days driving a tractor by myself in the fields of our Indiana farm. Either Mom would bring me a lunch or I would take it with me and it was almost always a cold cut sandwich, more often than not, bologna. Sometimes, I would accidentally drop my sandwich on the ground. Since it was all I had to eat, I wasn’t about to throw it away. I figured if I rescued it and brushed the dirt off faster than the germs could hop on (less than 5 seconds), I was safe. While I never got sick from this immunity-building exercise, I did get tired of bologna sandwiches. In fact, I pretty much avoid cold sandwiches altogether, especially now that I can make a warm and crusty panini instead. A few years ago, Oprah published the recipe for her “Love Sandwich” which is the basis for this recipe. I use smoked turkey instead of plain, roasted turkey and add tomato slices (dried by pressing between paper towels). Basil is the unique calling card of this sandwich. Substitute spinach or another green if you prefer. Looking for more ideas and information about panini? I’m not an expert but I know someone who is. Check out Panini Happy. 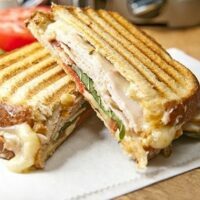 Kathy’s blog is full of creative recipes and helpful hints about making panini. She also gives advice for buying a panini maker, or you can read about making one using two skillets. A simple panini stuffed with smoked turkey, cheese, basil and tomatoes -- good for beginners. Spread light coating of mayo on reverse side of bread. Stack slices of cheese, turkey, tomato, basil and more cheese on top of mayo-covered side of bread. Cover with remaining slice of bread--mayonnaise side to the top layer of cheese. Cook on a panini grill preheated to HIGH or use a heavy skillet with another skillet placed on top of sandwich--in which case you will need to flip the sandwich after a couple of minutes. Allow to grill until cheese melts and bread is golden brown and toasty. If you prefer, add basil or spinach to sandwich after cooking. I wish you would come make this for me right now. Smoked Turkey, pepper jack (maybe habanero jack?) with tomatoes- – -perfect for a panini. How’d your quinoa experimenting turn out? I still follow that 5 second rule sometimes, lol. I know, I know it doesn’t really work but it makes me feel better to think it does. Yay! I still have basil! 🙂 This sandwich looks scrumptious. 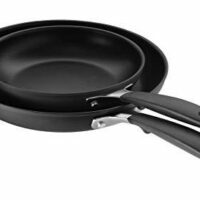 I don’t have a panini press, but I do have iron skillets in all shapes and sizes. I agree that a nice warm toasted sandwich is better than a cold one any day! 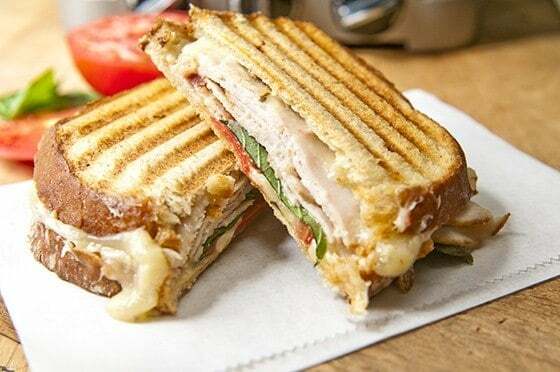 Love all of this…panini’s are a favorite! Basil in a panini is a must too. The fall favorites on your side bar look amazing especially those pumpkin pancakes, I need to give those try. My Thanksgiving turkey was roasted but some of the leftovers are still going to make it into this awesome looking sandwich. Looks awesome! I’m grabbing my basil while I still can! As a matter of fact, I moved the publication of this post up because of your last post about your basil and the impending frost. I need to make some serious pesto myself. Love the Love Sandwich! I’ve tried it before, it’s a great one – I’m sure smoked turkey makes it even better. And thanks for the kind words about my blog (Panini Happy, actually :-))!